The use of technology in the classroom is no longer up for debate. It’s now extremely clear: the effective use of classroom technology drives student results. But, any competent education professional would be quick to point out that student results are only positively impacted when they are introduced to the right tools. With a U.S. based edtech market that has raised more than a billion dollars over the last year, the options for technology tools to use in your classroom can seem infinite. Luckily, we’re here to help! We’ve scoured the internet, the latest conferences, and Twitter for the newest, most effective tools to use in your classroom. So, take a look below for our carefully curated list of the newest tools to add to your arsenal. Ok, fine! You may have heard of us by now, but we pulled some strings to get ourselves included on this list. Our super simple screen recorder gives teachers the ability to clone themselves, provide helpful student feedback, and assess student understanding. If you’re looking to create your own videos to flip your classroom, look no further! The Tour Creator allows you to lead viewers through a point of interest you select or a well-known location like the Eiffel Tower or The Statue of Liberty. With this tool, virtual field trips are extremely easy to organize. Try getting students involved by having them lead you through one of their favorite places. It would be an amazing relationship building exercise. Looking to use online videos in your classroom? Chances are you’d prefer to present this information to your students without the advertisements. ViewPure allows you to input your desired url and out pops a link for you to share with students (advertisement free!). Of course, there are other tools that will allow you to do much more with a YouTube video like EdPuzzle. But, if your objective is purely to create a “pure” video, look no further than ViewPure (pun intended 🥁). AutoDraw adds a new dimension to the classic white-boarding app! (We know: it’s not technically a video application. But, white-boarding apps are so much better when turned into a video like the one above). Start drawing and the tool attempts to determine what you’re drawing. Once you’ve drawn enough for the app to guess correctly, you can automatically switch your drawing out for their perfectly constructed one. ⭐️ Bonus Tip: Record your drawing process in Screencastify so that your students can hear your thoughts as you draw. Wakelet is an amazing tool for curation and collaboration. Teachers (or students) can create “wakes”full of information from articles, blogs, tweets, and more! As an added bonus, you can even save your Screencastify videos right into your collections. Feedly allows you to see all of the news of the day in one convenient spot! Once you’ve signed up, you can follow sub-sets of news or information feeds. You can also search for the things you care about and create your own feed. This is perfect for a quick morning update for you or for your students. As a relationship building piece, you can even encourage students to share their feeds with you. Let’s face it: students accumulate a ton of reference material over the course of a school year. Live Binders aims to make keeping track of those resources easier than ever. Students can create and organize their own online binders for easy reference. As a teacher, you can create your own binders to share with students or colleagues as well. Tes allows you to create quick digital lessons. After you have curated content, add activities to help make sure your students engage with and understand the material. Finally, finish it off by assessing students. 🌟As a bonus, add your Screencastify videos right into Tes Teach to have students learn from you even when you aren’t physically present! Ever come across something amazing on the web only to forget where you saw it? Well, WorldBrain’s Memex wants to make sure that never happens to you again. With their Chrome extension, you can annotate pages as you read. Then, go back to search them later based on time or keywords. This is perfect for curating content for a lesson plan or encouraging students to start planning for a big project. We 🧡 @peergrade! Ever thought of having students record feedback with Screencastify and then post the link in @peergrade? We love Peergrade! The platform seeks to change the way that students give peer feedback. As a teacher, you upload a rubric so that students know how to assess each other. Students are able to post anonymous feedback to each other. As a final step, students receive their feedback and are able to interact with it through comments. ProWritingAid is a Chrome extension that goes beyond a simple spell-check. It analyzes your writing for errors in grammar, style, and tense. Even better, it compares your writing to some of the greats of your writing style to see where you fall in. Have students looking to write the next great blog? Have them analyze their writing against successful bloggers to see where they fit in. The cost to subscribe is a bit hefty 💰but they do offer a free trial that’s perfect for determining if this is the tool for you before expending any money at all. Trello has revolutionized the way that teams communicate at work. It also has untapped potential to change the way communicate in education. Users create boards. From there, they add lists filled with cards which can denote things that still need to be done, things in progress, and the illusive list of things that are already done. Users can communicate right on the board. As an added benefit, cards can even be assigned to specific users for a quick look at who’s responsible for what. Slack started out with a particularly ambitious goal: to eliminate the need for e-mail’s. Here at Screencastify HQ, e-mails have become much less prominent since we’ve begun to use Slack. Instead, we communicate over various channels within Slack. In your classroom, Slack could be the perfect tool for communicating with colleagues. You could even encourage students to communicate through Slack while working in groups. 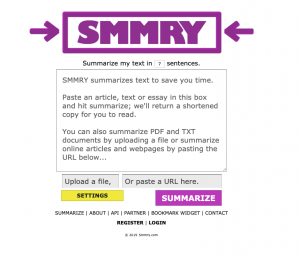 SMMRY is so simple but so necessary for your classroom. Paste text into their website and out pops a summary at the length you designated. That’s it! But, the tool could be perfect for teaching your kiddos how to effectively summarize. It could even be great for helping you get through loads of content quickly in your search for the perfect resources for your students. Project Gutenburg offers an easily searchable library of more than 50,000 eBooks. Most of the books in their library are older and out of copyright. Direct your students here to read some of the American classics like Narrative of the Life of Frederick Douglass, an American Slave or Jane Eyre: An Autobiography. Teachers have to be some of the busiest folks on the planet 🌍. Actually Read it Later is a Chrome Extension that makes sure you don’t neglect your reading. Add content using the Chrome extension and you’ll be prompted to set a time when you’ll be ready to read. At your specified time, the extension notifies you that it’s time to read. Never forget about an amazing piece of content again! Qikipedia is a pretty awesome Chrome extension. Highlight any content on a page and you’re shown the corresponding Wikipedia page. This is perfect for students struggling to understand a reading because a few concepts are foreign. It could also be perfect for students attempting to decipher content in a language different than their native language. Creaza is a self-described storytelling application for the classroom. But, it’s capable of so much more! You can create cartoons, simple graphics, videos, or just about anything else you can imagine! Use the app to encourage your students to create dynamic stories. Alternatively, you can bring a concept to life with their tools. ⭐️ Bonus Tip: Creaza supports uploading files. Quickly upload your Screencastify videos to tell a Pulitzer Prize worthy story. More than a Mapp is a super cool application available for iPad and iPhone users. Users can explore their own city and learn more about important sites in African-American history. This app is made even cooler by the fact that users can contribute their own sites of significance. The makers of the app have created an Educator’s Guide jam packed with more information about how to make the most of the app in your classroom. Real World Math is our favorite four-letter word: 🆓 They have an amazing collection of math exercises created in Google Earth that are guaranteed to engage your learners far more than static numbers and variables on a page.